The FDA recently warned that plasma infusions from young people provides “no proven clinical benefit” against normal aging, Alzheimer’s disease, or a host of other diseases. Directors Gottlieb and Marks from the Center for Biologics Evaluation and Research say young-blood transfusions can pose risks. Most research thus far into young-blood transfusions has been conducted in mice. Some of the mouse studies have been encouraging, but other studies have been less encouraging. One biotech company is currently testing a plasma-derived product in Alzheimer’s patients; a previous study from the company yielded mixed results. As business owners, we are all looking for ways to increase sales and overall foot traffic to our storefront. Especially when it comes to owning a brick and mortar, your sales instantly stop the second you lock the front door. Imagine if you could be making sales with the doors shut and the closed sign up... eCommerce is the solution! Let us talk about your salon. Think about your customer base, specifically your regular clients...How often are they visiting? If I had to guess, they are probably coming in about once a month. When it comes to the one off clients maybe once every three months. The reason I want to get you thinking here is because of the time spent away from your salon. They are clearly using beauty products whether it is shampoo + conditioner to face wash and hand cream, so why not provide them with these products. These clients come to you wanting to feel their best! They are going to take your advice as you steer them in the right direction. Also, they are more likely to buy products from you after a great experience! They will want to increase longevity of the satisfied product. Keep this in mind especially with stores like Target, Sephora and Amazon where such products are so easily accessible. If they do not want to buy products immediately after their treatment, it would be wise to provide an option for them to do so before they come back and see you, eCommerce! Afterall, without an online shopping cart to directly buy beauty supplies from, they will mostly end up on Amazon Prime. While it may seem tedious and time consuming, believe me it is not all that complicated. I have laid out a few important categories to help you maximize your online potential! How many followers do you have on Facebook or Instagram? Imagine each of those followers making an average of two purchases a month from your store. You can literally turn your social following into an extra stream of revenue by incorporating an online shopping cart. They already follow you, so why not post merchandise and give them two clicks to make it theirs? Not to mention, the folks from out of town will be able to purchase your inventory from their couch miles and miles away. Lastly, the incorporation of this shopping cart will inevitably drive foot traffic into your store. For example, I am browsing Instagram looking for Christmas gifts, I then see your post of a new fur sweater or face cream. My mind immediately starts thinking, what else does this store have to offer? If I purchase the fur sweater for my mom, maybe I can grab something for my sister too... Hypothetically, I buy both on Instagram - they arrive to my house and everyone loves the new swag! They ask me where I got it, and now we are all headed to the brick and mortar. Yes, that may have seen like a silly story but guess what? It happened last week! If you see your salon business as a high quality or potentially trendy, and modern salon, it is very important to focus on high-quality pictures. Take the time to invest in a professional grade camera, lighting, and maybe even a graphic designer to edit the photos to appeal better to your target audience. You should also consider doing before and after photos that showcase how you have transformed your client with your amazing stylist expertise. Set up a loyalty rewards program that requires your customers to share your salon’s social media handles online. By doing, you can increase customer retention as well as utilizing your customer base for online free word-of-mouth advertising. Not only will your clients feel obligated to share their experiences online, but they will take the pride in knowing they will receive loyalty points or bonuses which will bring them back to your salon. Create a selfie station in your salon where customers can take their own selfies of their hair, makeup, or nails. Put your logo on a cute, creative, banner and let them spread how awesome your salon is -- without you having to lift a finger. Read more about the Salon Loyalty Program. Your clients expect for you to have a website, and if you do not, that speaks volumes about your brand in a way that is inefficient. Invest money in a website and landing page so that your customers can utilize to gain more information from you. Please keep in mind that this will also allow you to appear in Google search results, and it is very beneficial to you especially for localized searches. If you need any help with creating an attractive website, click here to read more. Create compelling and interactive Facebook ads that will grab the attention of your target audience. On Facebook, you can refine the criteria of the ads to show up in the feeds of your target audience in the area your salon resides. If your ads are compelling enough, you should see an increase in your inquiries as well as salon appointments. Strategize and research effective and creative advertisements for salon businesses. 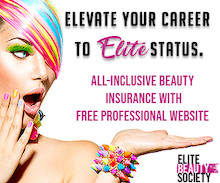 A website for your salon is a great tool for you to use to attract potential clients. Think of it as an extension to your business; what online visitors see could be what establishes your credibility as a professional. You want your online presence to be reflective of the brand you’ve created in-house. You wouldn't want a potential customer to walk into your salon and think it’s a complete mess, chances are they’ll turn around and walk out the door. Same goes for your website. To avoid that from happening, we’ve put together some tips and tricks from our ebook, The Easy Peasy Guide to Having a Killer Website, to make sure your website has a great design that truly represents your brand. 1. Have a clean logo that links. Your logo is your brand. You want to make sure your logo is on your website and that it links back to your homepage. 2. Use one primary color and one secondary color. You don’t want your website looking like crayola exploded on it. Keep your color scheme to 2-3 colors throughout. Use the right font for what your company is about. For example, if your company is selling arts and crafts, it is okay to use a more decorative font . However, if your company is a law office you may want a more stern and simple font like Helvetica. Remember though, just like colors, do not overuse fonts. If you want to use a fun font, stick to one fun font and one basic font like Times New Roman or Helvetica. Also, only use 2-3 different fonts per website. 1 font is good, 4 fonts is ugly. Your Diet and Your Brain! The way you feed your body affects your brain. Evidence is starting to line up in favor of certain foods with the aim of reducing the risk of dementia and Alzheimer’s disease. Our brain requires certain nutrients to function smoothly and biologically. One major study showed that a strict adherence to a diet known as the MIND diet reduces dementia risk by up to 53% for people ages 59 to 98. Success in Beauty, The Secrets to Effortless Fulfillment and Happiness is a revolutionary book written by a variety of women about how to be happy and fulfilled with little or no effort at all! This book has no shortage of vital information about how you as a woman can enhance yourself your life and your business. Bonnie Bonadeo Co-author and contributor to Success in Beauty book titled section, Beauty Enthusiasm, My Journey to Joy. Uncovers that repetitive pattern that we are women sometimes get caught up in of adding more to the outside of our lives’ thinking that will bring us more happiness and joy only to discover that it ultimately caused more stress and anxiety in not only doing more but always doing more for others and not yourself. As she shares her hardships and what finally had her redefine the meaning of success in order for her to find that ever elusive passion and joy in her life. It has been one year since my friend and boss, Horst Rechelbacher, passed away. We took a chance working together for the first time in 1989 when he hired me to be his business assistant. That position lasted exactly one month when he asked me to step into his new adventure, the Aveda Esthetique, his signature retail shop. 365 products later, Aveda Esthetique, launched on Madison Avenue in New York. Horst once again changed the world of beauty. All of the products he created throughout his life changed the world of beauty over and over again. "Eco-chic" was his favorite catch phrase. He created the natural category in the beauty industry that carries into today. Flash forward 26 years . . . I have been trying to determine an appropriate way to honor my friend Horst. Horst loved the beauty industry and all licensed professionals. While we worked together at the Aveda Corporation, he always developed products and promotions with the licensed professional in mind. Why it was my goal to become a licensed Instructor. . . It could be yours too! Looking at the ever changing nature of the beauty industry will be a great way to help answer that question. Having lived by the credo “change is good”, the beauty industry has been a great choice allowing me to not only change but to grow, try new things and truly experience all avenues of the business. When SSPA sent out an email that they were now offering the 38 Hour Instructor Licensure Course, I had recently been laid off from my job with Horst Rechelbacher after his death. Having worked with Horst for many years, I knew he believed in the credo “you are on your path” and I have tried to live my life in the same way. Believing everything happens for a reason, I jumped at the chance to learn a new skill and ultimately become more employable as I seek a new position. Seeking a new position, combining my new educator skills with my varied job experience, I hope to become a hybrid of sales/marketing/educator that most job candidates don’t possess within the beauty industry. Most organizations seek people able to perform varied duties and fill different needs within a single job classification. Becoming a licensed educator will help in my career to do just that. Welcome to the SSPA Beauty Blog Live! My name is Deborah Otten and I have taken on the role of blogger for the Salon & Spa Professional Association team. While I am excited for this new responsibility, I am also a little nervous. Those of you reading this post please send me feedback (positive or negative, I am a big girl… really) and maybe an idea or two for future postings.